Amazing plan details, thank-you for helping us build our dream shop. I'll highly recommend to everyone. - Building plans by Medeek Design - Owned and operated by licensed engineer Nathaniel P. Wilkerson, P.E. - FREE PDF Download of Plansets (Limited to specific plansets). - FREE materials list before buying any plans. Available upon request. - FREE postal shipping within Continental US and Canada. 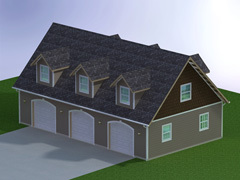 - Full 3D Models included with every planset. - Preview entire Planset prior to purchasing. 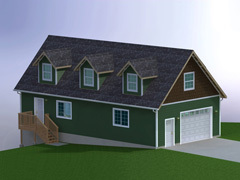 - Visit our Design/Build Forum for answers to all your construction questions. - All Plansets are Guaranteed for your satisfaction. - Site design criteria maps for seismic, wind and snow. - State specific snow load maps and snow load studies. - CAD library with various architectural and structural details (DWG file format). - Online Snow Load Calculator with balanced and unbalanced snow loads. - Online Wind Load Calculator using the Envelope Procedure (ASCE 7-10, Ch. 28, Part 1). - An API for progmatically querying seismic, snow and wind data. - The Truss Designer allows calculation of geometry and loads applied to common truss types. 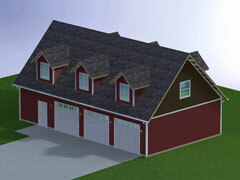 - The Medeek Truss extension generates truss, roof and floor geometry within SketchUp. - The Medeek Foundation extension generates foundation geometry within SketchUp. - The Medeek Wall extension generates wall, window and door geometry within SketchUp. - A selection of spreadsheet calculators for walls, footings, portal frames, fences and decks.